This delicious dessert is worth every decadent bite. Preheat oven to 325 degrees Fahrenheit (160 degrees Celsius). Line 18 mini muffin cups. Beat eggs and sugar on high speed until light in color. Add the remaining ingredients and mix until incorporated. Pour batter into lined mini muffin tins. Bake for 18 minutes or until a toothpick inserted in the center comes out clean. Meanwhile, mix the coffee syrup ingredients together. Spoon onto the warm cupcakes, one to two teaspoons at a time, until the syrup is finished. It’s okay if some drips over the sides. Let the cupcakes sit on a rack to dry for about 10 minutes or so. These cupcakes can be refrigerated in an airtight container for up to 24 hours. Beat the heavy cream until fluffy and stiff, adding sugar while it’s beating. Add the cream cheese and fold in until smooth. 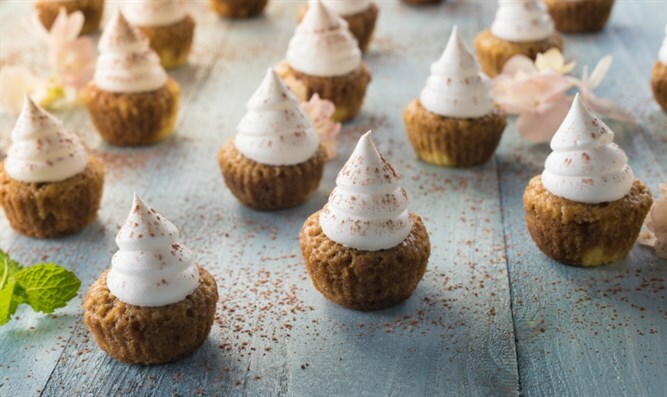 When ready to serve, add a dollop of cream to the top of a cupcake, and dust with cocoa.